The burpee has been around since 1939, when Royal H. Burpee invented the bodyweight movement as a quick, simple way of administering fitness tests and included it in his thesis for a doctorate in applied physiology from Columbia University. Over the last 75 years, the burpee has evolved from its original incarnation—a four-count movement to be performed four times in a row in order to evaluate fitness—to its current version: a six-count movement that includes three jumps, a couple squats, a push-up, and a not insignificant amount of torment. It’s difficult to think of another bodyweight movement as demanding as the burpee. To understand why, consider that the burpee requires a squat, a jump, a push-up, another jump, a squat, and yet another explosive jump. A full-body movement, the burpee calls on just about every major muscle group, so every part of you is working darn hard to bang out just one rep. Plus, as Greatist Expert Eugene Babenko explains, “20 burpees equates to more than 20 air squats, 20 push-ups, and 20 jumping jacks,” taking “the body through a very full range of motion requiring a lot of oxygen in a short period of time.” In other words, doing just a single burpee requires a ton of movement and places huge demands on the burpee-doer’s cardiovascular fitness. There’s no doubt that burpees are intense—and that’s a good thing. 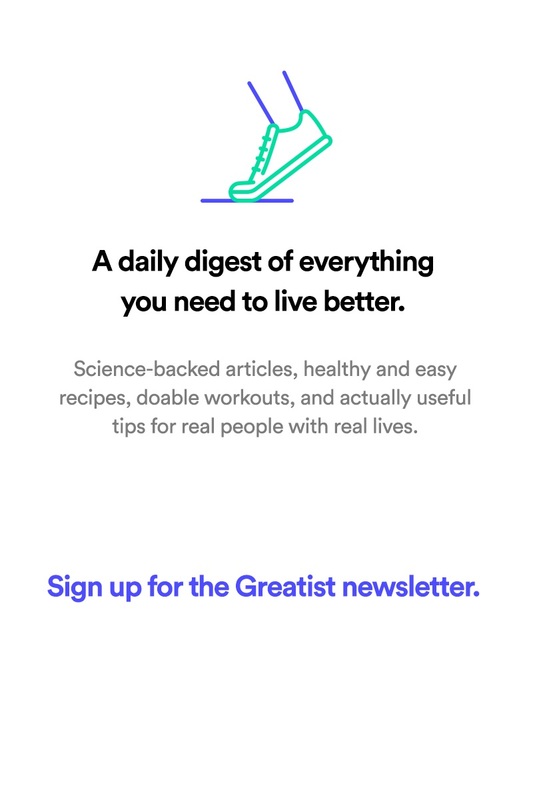 Studies have shown that when it comes to exercise, intensity matters: The more intense the movement, the greater the post-exercise elevation in metabolism and improved cardiovascular health High-+and+moderate-intensity+aerobic+exercise+and+excess+post-exercise+oxygen+consumption+in+men+with+metabolic+syndrome.+Larsen+I,+Welde+B,+Martins+C.,+Scandanavian+Journal+of+Science+&+Medicine+in+Sports.+2013+Oct+14. 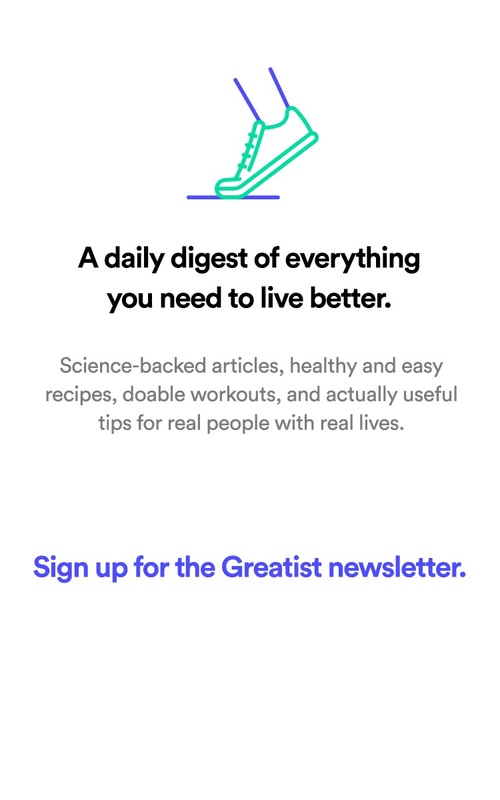 Evidence+based+exercise+-+clinical+benefits+of+high+intensity+interval+training.+Shiraev+T,+Barclay+G.+Australian+Family+Physician.+2012+Dec;41(12):960-2. .
Now that we’ve promised you the conditioning tool to end all conditioning tools, it’s time to get to it. No more procrastinating; let’s get down to burpees. 1. Bend over or squat down and place your hands on the floor in front of you, just outside of your feet. 2. Jump both feet back so that you’re now in plank position. 3. Drop to a push-up—your chest should touch the floor. You can also drop to your knees here, which makes the impending push-up easier. 4. Push up to return to plank position (this can be a strict push-up, a push-up from the knees, or not a push-up at all (i.e., just push yourself up from the ground as you would if you weren’t working out)—your choice). 5. Jump the feet back in toward the hands. 6. Explosively jump into the air, reaching your arms straight overhead. So now you know how to do a single burpee. But where does that leave you in a workout that requires several reps in a row? Or 100? Or—gasp—a mile of them? Take it from CrossFit coach Erica Giovinazzo, who does plenty of burpees and programs them for her athletes. Here are her five favorite tips for getting through a burpee-heavy workout, in her own words. 1. Don't rest. Pace. If you stop [in the middle of your reps], it only takes longer to get going again. Most people need to stop because they’re going too fast, but the best thing you can do if you’re doing a lot of repetitions is to go "slow" and steady: Pick a pace you can maintain for however many burpees you need to do, and don't stop. So if you only have to do five to 10 burpees, you can go a little faster. But if you’re doing 50 burpees, go slower so you can maintain a consistent pace. 2. Feet go before hands. If you want to take a second off of your burpee, shoot your legs back before your hands hit the ground. When most of us first learn a burpee, we usually learn that our hands should hit the ground before we jump our feet back. But once you understand that basic movement, you can shoot your feet back before your hands land on the ground. 3. Turn on robot mode. When you have a lot of burpees to do...stop thinking about how man burpees you have to do. Just go into robot mode. Approach each small movement one at a time: "drop to the floor," "feet back," "jump up," etc., and repeat. Just slip into auto-pilot and keep counting. Thinking ahead too much gets you freaked out about how many you have left to do. Just keep moving and focusing on one movement at a time. 4. Breathe! As much as you can, try to get into a rhythm with your breathing. Experiment with what works for you, recognizing that as you get more out of breath your rhythm will change slightly. But always try to keep your breathing as steady as possible. 5. Avoid common faults. Many people fall prey to two faults. The first is arching the back to come out of the burpee, as if they were doing an upward dog pose. This can lead to an aching lower back. The second fault is losing range of motion. The chest should touch the floor, not just the belly button or pelvis. The hips need to open up all the way at the top when you jump. Try looking straight ahead as you stand up and jump— this can help you to remember to open your hips. One last note: When burpees are being performed for time (as in, doing as many of them as quickly as possible), the crispness of each of the movements may fall by the wayside as the burpee-er tries to make it through their workout. And that’s okay—as long as you maintain proper form and a full range of motion (as you bang out reps, each burpee is going to look more like a fluid set of flops and jumps and less like the six crisp, separate movements enumerated above). That said, if you cannot perform a full burpee as prescribed, consider modifying the movement to make it less taxing. If you have challenges to mobility or are new to working out or burpees, start with a modified version! Babenko likes animal drills to open tight joints, including scorpion, cobra, bear crawl, and crab walk. Giovinazzo says that before doing burpees, she likes to warm up her hip flexors, feet, rear deltoids, and wrists. In addition to whatever pre-workout warm-up you’re doing, try mountain climbers for the hip flexors. She also recommends rolling a lacrosse ball on the rear deltoids and rolling the bottom of the feet with a ball or a barbell. Finally, stretching the wrists (even simple wrist rolls are great) will keep them nice and loose. 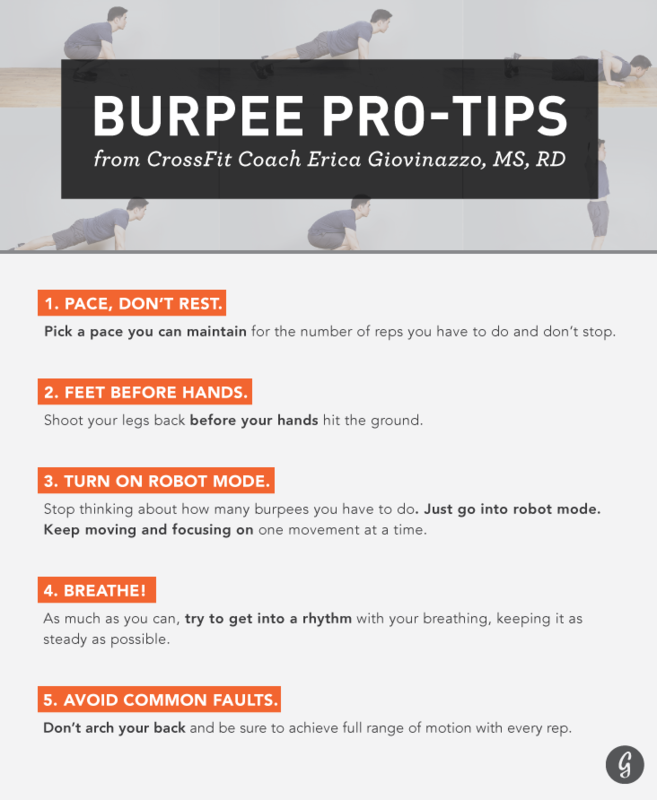 Giovinazzo says these are all great drills for before and after burpee-centric workouts. There’s nothing more beautiful than the idea of a burpee—a single bodyweight exercise that works tons of muscles while challenging cardiovascular fitness. Of course, once you find yourself flopping down, pushing up, and jumping explosively over and over, there’s less beauty and more… sweat. Nevertheless, the burpee remains an amazingly effective (if punishing) movement, and requires nothing more than your bodyweight and a little space. Once you master the basics, consider moving on to some more challenging variations like the burpee broad jump or even the burpee pull-up! Are burpees part of your regular workout routine? Share in the comments below, or get in touch with the author on Twitter @sallyt.